by Eric Jendrock, at al. 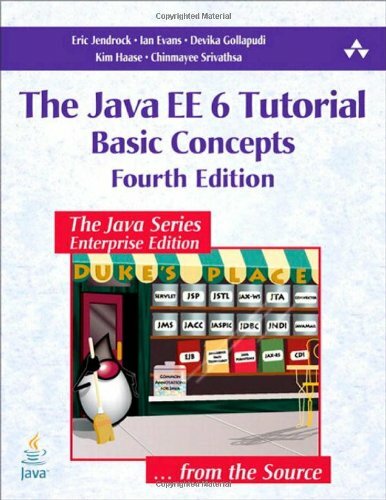 This tutorial is a guide to developing enterprise applications for the Java Platform, Enterprise Edition 6 (Java EE 6). Before proceeding with this tutorial, you should have a good knowledge of the Java programming language. Written for technical architects and senior developers tasked with designing of J2EE java applications. The book will guide you through the entire process of delivering a project from analysis through application deployment. The book describes the key design issues in applications supported by the J2EE platform and offers practical guidelines for both architects and developers. It explores key J2EE platform features such as Java servlets, JavaServer Pages, etc. This is Your First Cup: An Introduction to Java EE Platform, a short tutorial for beginning Java EE programmers. This tutorial is designed to give you a hands-on lesson on developing an enterprise application from initial coding to deployment.